The Bay Bomb - Pom pom play! One fine day while roaming around Bandra, searching for gifts for a friend I stopped at my favourite store when it comes to footwear. Every time I enter the shop I feel like each and every pair is so unique, quirky and beautiful. Amidst that, I couldn't get my eyes off a pair, colorfull, tan, pom pom tie up flats. It was that phase when i was ( I still am) obsessed with pom poms. Snubbing the constant "Noooo!" 's from all my friends, I had fallen for that pair head over heels. Not any force on earth could stop me from buying those and I finally got 'em. they are by far the best footwear i have ever owned. Namaslay everyone!🙏 How you doing? 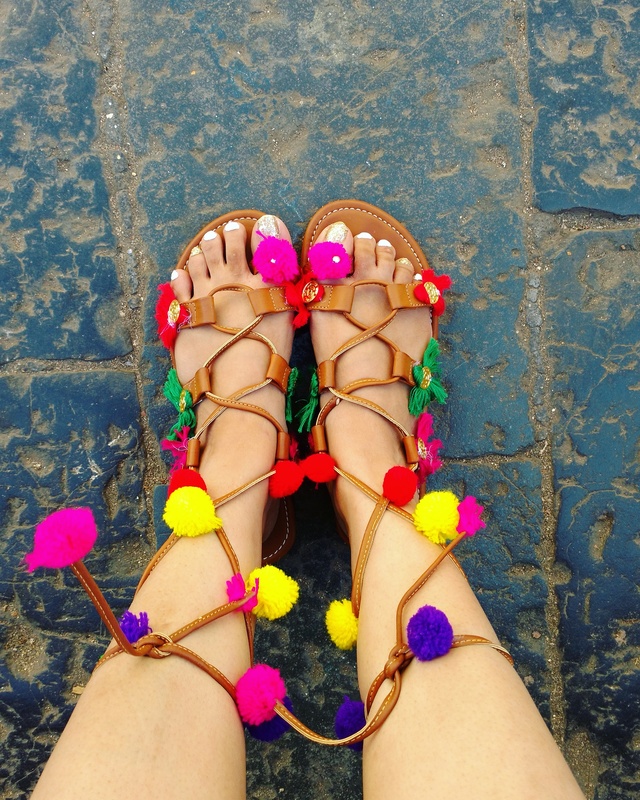 Pom pom play is all about how I styled a pair of pom pom tie up flats. Starting with the tee, since I had a very vibrant colours in my pair footwear I wanted to keep my outfit as toned down as possible. I went for this plain green, basic t-shirt I had lying around. You can even go for white or any other Colors you like or have. Paired the plain tee with a ripped denim shorts. I got it from a shop in vile Parle, I don't know​ its name though. 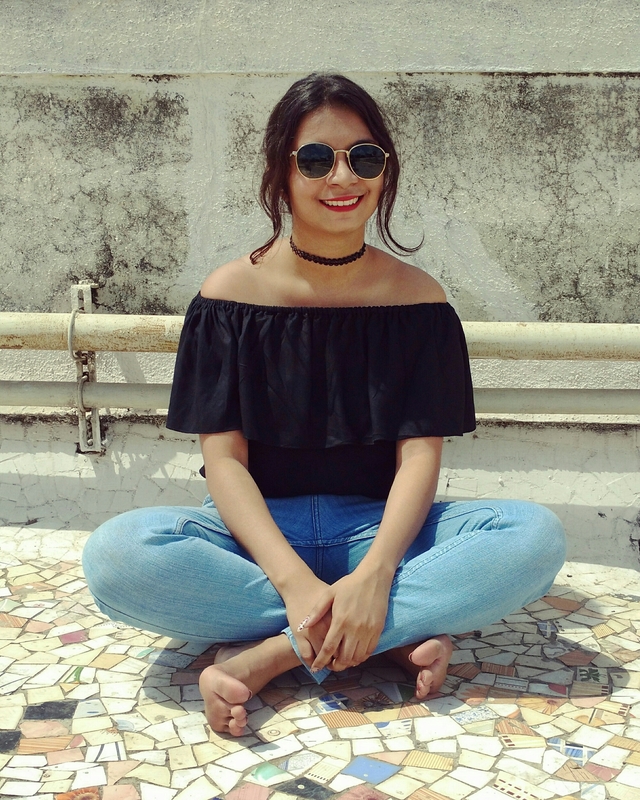 You can find similar shorts at many other places like Bandra or Colaba. Starting with my accessories I wore this D.I.Y pom pom earrings. ( Told ya, I am obsessed) Got these threaded bangles which are all colorfull again. I bought these long back from Borivali station where you have lots and lots of thela walas who sell fancy bangles. In another hand is a ring matching with my t-shirt. Let me tell you, this one is a very cool ring shaped like a pair of glasses. Got it from a thela in Vile Parle. 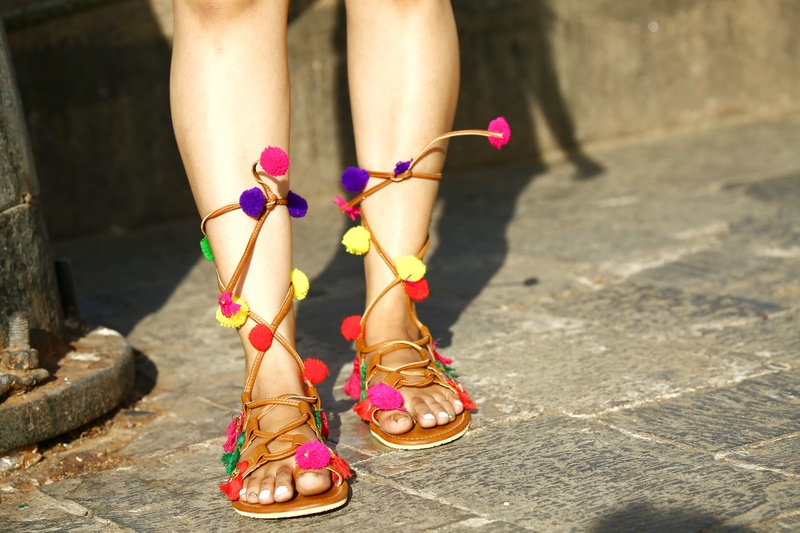 And and and coming to the star of the look, my pom pom tie up flats. They are so boho and nice and colorfull. You can jazz up any plain or dull outfits with this pair of beauty. So that's​ how I played with pom poms​ and created this lazy yet dressy look. I feel it's a great summer #OOTD. It's laid back and you really don't have to take a lot of efforts. Pictures by Harshal Chaudhari. Twist the look your way and tag me. Let's spread girl love and inspire each other. Come together and make a dope fam, the Bomb Fam! If you like it, do comment and let me know or Share it with your friends. Don't forget to follow me by clicking on the "Follow" botton on the down right of your screen and recieve a notification evey time I post a new blog. Stay tuned for my next one! Till then stay bomb and keep slaying! More hope, love and positivity to you, The Bay Bomb, Sonia Patel.